Facts you should know when visiting or traveling in bear country. Bears don't like surprises! If you are hiking through bear country, make your presents known, especially where the terrain or vegetation makes it hard for a bear to see you. Make low noise, sing, talk, or tie a bell to your backpack. If possible travel with a group. Groups are noisier and easier for bears to detect. Avoid thick brush. If you can't try to walk with the wind at your back so your scent will warn bears of your presence. Contrary to popular belief, bears can see as well as people, but they trust their noses much more. Always let the bear know you are there. Bear, like humans, use trails and roads. Don't set up camp close to a trail they might use. Detour around areas you see or smell carcasses of fish or animals, or see scavengers congregating. A bear's food may be there and if the bear is nearby, it may defend the cache aggressively. Don't crowd bears. Give them plenty of room. Some bears are more tolerant than others are, but every bear has a 'personal space', the distance within which a bear feels threatened. If you stray within that zone, a bear may react aggressively. When photographing bears use long lenses getting close for a great shot could put you inside the danger zone. Bears are always looking for something to eat. Bears have only about six months to build up fat reserves for their long winter hibernation. Don't let them learn human food or garbage is an easy meal. It is both foolish and illegal to feed bears in the wild. Cook away from your tent . Store all food away from your campsite. Hang food out of the reach of bears if possible. If no tree is available, store your food in airtight or specially designed bear-proof containers. Remember pets and their food may also attract bears. Keep a clean camp . Wash your dishes. Avoid smelly food like bacon and smoked fish. Keep food smells off your clothing. Burn garage completely in a hot fire and pack out the remains. Food and garbage are equally attractive to a bear so threat them with equal care. Burying garbage is a waste of time. Bears have keen noses and are great diggers. If a bear approaches you while fishing, stop fishing. If you have a fish on your line don't let it splash. If that's not possible cut your line. If a bear learns it can obtain fish by just approaching a fisherman, it will return for more. Close encounters what to do. If you see a bear, avoid it if you can. Give the bear every opportunity to avoid you. If you do encounter a bear at a close distance, remain calm. Attacks are rare. Chances are you are not in danger. Most bears are interested only protecting food, cubs or their 'personal space'. Once the threat is removed, they will move on. Remember this: Identify yourself. Let the bear know you are human. Talk to the bear in a normal voice. Wave your arms. Help the bear recognize you. If a bear cannot tell what you are, it may come closer or stand on its hind legs to get a better look or smell. A standing bear is usually curious, not threatening. You may try to back away slowly diagonally, but if the bear follows, stop and hold your ground. Don't run! You can not outrun a bear. They have been clocked at speeds up to 35 mph, and like dogs, they will chase fleeing animals. Bears often make bluff charges, sometimes to within 10 feet of their adversary, with out making contact. Continue waving your arms and talking to the bear. If the bar gets too close, raise your voice and be more aggressive. Bang post and pans. Use noisemakers. Never imitate bear sounds or make a high-pitched squeal. If attacked . . . If a bear actually makes contact, surrender! Fall to the ground and play dead. Lie flat on your stomach, or curled up in a ball with your hands behind your neck. Typically, a bear will break off its attack once it feels the threat has been eliminated. Remain motionless for as long as possible. If you move, and the bear sees or hears you, it may return and renew its attack. 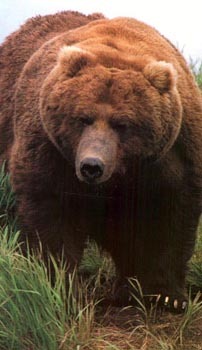 In rare instances, particularly with black bears, an attacking bear may perceive a person as food. If the bear continues biting you long after you assume a defensive posture, it like is a predatory attack. Fight back vigorously. Firearms should never be used as an alternative to common-sense approaches to bear encounters. Most state laws allow a bear to be shot in self-defense if you did not provoke the attack, and there is not alternative. The hide and skull must be salvaged and turned over to the authorities. This article adapted from Bear Facts, courtesy of Alaska Dept of Public Safely and Wildlife Protection. Copyright © 1997 - 2014 Bright Star Promotions, Inc.